¿Sueña a menudo con tener una vida más gratificante? ¿Aspira a tener un mejor trabajo, un matrimonio sólido, un hogar feliz? ¿Desea tener mejores relaciones con su familia y amigos? Quizás usted simplemente quiere alcanzar más y dejar un legado duradero para las futuras generaciones. Si usted es como algunas personas, posiblemente ha escrito estas metas y sueños en una lista llamada "Cosas para hacer mañana". No puede perseguir lo más importante en su vida, porque su día está atestado por las demandas de lo rutinario y las prioridades de otras personas. En un lenguaje claro, Joel Osteen presenta siete pasos simples e inspiradores que le ayudarán a mejorar su vida y experimentar la victoria, el gozo y la satisfaccióm todos los días. 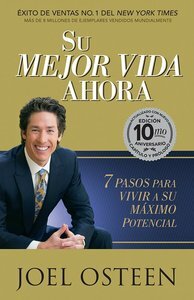 About "Su Mejor Vida Ahora: 7 Pasos Para Vivir a Su Maximo Potencial"
Joel Osteen (born 1963) is a native Texan and the Pastor of Lakewood Church, Houston, Texas, which according to Church Growth Today is America's largest and fastest growing church. In 2005 Joel had to move Lakewood Church into bigger premises, and at 16,000 seats it is the largest regularly-used worship centre in the United States. Each week Joel delivers God's message of hope and encouragement to more than 38,000 attendees. According to Nielsen Media Research, Joel is the most watched inspirational figure in America. His weekly sermon is broadcast into every U.S. television market where it is viewed by seven million Americans each week and more than 20 million each month. His weekly broadcast is also seen in almost 100 nations around the world. Joel's first book, Your Best Life Now (2004), and second book, Become a Better You (2007) both debuted at the top of the New York Times bestseller list when they were released. They each have sold millions of copies, and have remained on the bestseller lists for months. Five more books from Joel have also become New York Times bestsellers. Joel is the son of the late John Osteen, who was originally ordained as a Southern Baptist minister. After undergoing 'baptism in the Holy Spirit' in 1959, Osteen senior founded Lakewood Church in an abandoned feed store. The membership of this phenomenally successful charismatic church would eventually grow to 15,000. Joel attended Oral Roberts University in Tulsa, Oklahoma where he studied radio and television communications. In 1982, he returned to Houston and founded Lakewood's television ministry where he produced his father's televised sermons for 17 years. For many years, John Osteen encouraged his son to preach, but Joel always declined, preferring to work behind the scenes. However, in early 1999 Joel felt compelled to accept his father's invitation and he preached his first sermon on January 17th of that year. Little did anyone know that would be the last Sunday of John Osteen's life - he died suddenly of a heart attack at age 77. Two weeks later, Joel began preaching regularly and later that year was installed as the new Senior Pastor of Lakewood Church. Joel's extraordinary success can be found in his core message: That our God is a good God who desires to bless those who are obedient and faithful to Him through Jesus Christ. It is Joel's deepest desire that his own life be an example of that principle and that everyone who hears this message of hope and encouragement would choose to accept God's goodness and mercy and to become all that God wants them to be. Joel has been criticized from many quarters during his ministry, by those who are suspicious of 'prosperity gospel' teachings, and wary of megachurch evangelists. Joel remains focused on preaching God's blessing with integrity, and has steadfastly refused to be drawn into controversies about various hot-button topics, whether theological or social-cultural. Joel is married to Victoria, who co-pastors Lakewood Church and is also a bestselling author. They were wed in 1987, and have two children, Jonathan and Alexandra.